Last year I obtained a marriage record from a church in Germany that was not available at the Family History Library. I thought this might be a helpful example of how you can sometimes find genealogy records by writing to churches or archives in Germany. My immigrant ancestors, August and Christine (Walter) Beine came to the US in 1880 with 7 of their children. August Beine was originally from a small German village called Grosseneder and Christine Walter came from another village called Siddinghausen. I have already researched their family lines in each of the villages, but I was not able to find their marriage record in either place. But I have a photocopy of a family document that gives the birth and baptismal dates of their German born children from the St. Nikolaus Catholic Parish in Stoppenberg, Germany. Stoppenberg was then a suburb and is now a neighborhood of the city of Essen. I always assumed the couple was married in Stoppenberg and recently I decided to pursue obtaining a copy of their marriage record. The LDS Family History Library does not have microfilmed records for the St. Nikolaus Parish. So I needed to determine where the church's records, if available, were located. 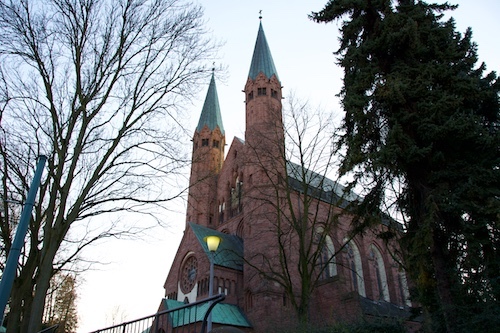 Essen is a Catholic diocese ("Bistum" in German), and using Google, I found the Essen diocese has a website: http://www.bistum-essen.de. From the website's contact link I sent an email asking where the St. Nikolaus parish records were today. I received a response saying the records were still at the St. Nikolaus church and was given an email address for the parish priest. I emailed the parish priest, asking if I could obtain the marriage record of August Beine and Christine Walter, and the baptismal record of their son, also named August, who is my great grandfather. Three weeks later I received a response saying he had found the records I wanted and was sending copies. A few days later the photocopies arrived in the mail. I had inquired about a fee in my email to the church, and the response was: "We don't get a fee for this service, but it would be nice if you can give a donation to a project of the Roman-Catholic parish in your town." So I made a donation to a local parish. Congratulations Joe! What a terrific discovery! I too have many German ancestors. They lived in Neckargemund, Germany. In the last six months I have obtained quite a few documents off of microfilm from the Family History Center near my home. Thanks to a German translator I am acquiring a family history full of wonderful details. Thank you for your post. Good luck in your research! Wow, what a great treasure you've gotten in copies of those original records, and no fee as well. Very wonderful, and refreshing, when genealogy can cost so much. Yes, wonderful set of circumstances. Essen is the city of my birth as well as my mother's. Her maiden name was Koepke and her maternal grandparents' name was Pehlke. They were not Catholic but rather Lutherans who fled Prussia in what is now modern day Poland in 1920. By the way, Essen-Stoppenberg is where the huge supermarket chain, Aldi started. Always have to plug my hometown. Again, congratulations.